Now that I have confessed that I have a minivan, I might as well tell you about another way in which I’ve become an old fogey without even noticing: these days, I like having parties in the morning. The kids are in good moods, the house hasn’t been wrecked yet by the the daily tornado of family life, and you can drink mimosas. But most of all, brunch is such an easy meal to prepare for a crowd. All you need are big bowl of fruit, a cake (or two, in the case of J’s recent birthday) these eggs, and lots and lots of coffee. This dish, or something like it, is one of the easiest ways I know to cook up a dozen or more eggs at once. You can vary the filling by adding any vegetables, cheese, or meat you’d like. I kept this one simple because I love the flavor combination of sharp cheddar and cooked-until-sweet onions…and also, I will admit, because monochromatic foods are usually a hit with the kids and we were expecting many, many kids. 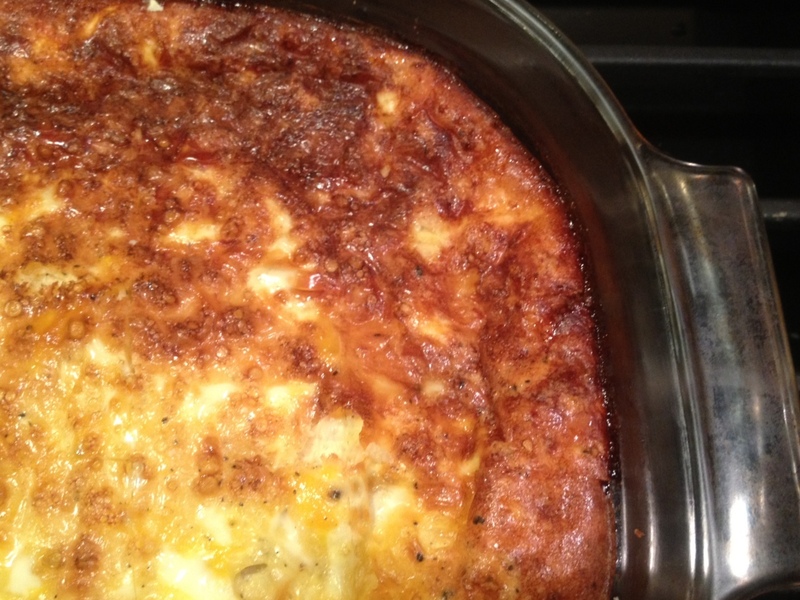 Cheddar and Onion Egg Bake for a Crowd: Butter a large baking dish and sprinkle breadcrumbs all over the bottom. Dice a couple of big onions and saute with a big pinch of salt until the moisture evaporates and they begin to brown. Transfer onions to buttered pan. Top with several big handfuls of grated sharp cheddar cheese. Whisk a dozen (or even a few more) eggs with a couple cups of milk, or part milk and part cream, and plenty of salt and pepper. Pour egg mixture over cheese and vegetables and bake at 400 until set in the center, about 45 minutes. This entry was posted in Breakfast, Eggs, Feeding Kids, Food, Recipes and tagged brunch, cheese, eggs, food to soak up a mimosa, lifestyle, onions, parties, vegetarian on June 9, 2012 by emmycooks. Yum! Though I would have to skip the onions if I were making this for my kid. But it would still be tasty! I love brunch parties too. You can get away with cake for breakfast, as long as you call it coffee cake! Ha- I just picked up a cookbook at a garage sale yesterday about easy entertaining. All the plans looked so lovely until I came to my senses that I have two kids and the idea of having some fancy affair is just not in the cards right now. But brunch- that’s one I can do and enjoy without stressing out. That sounds delish. Colby cheese I and on hand the other day. So good! I’ve never made such a big batch though. I’m definitely going to try this recipe! Yum! The trick with a big pan of eggs is that it takes the center much longer to cook through. But it will get there! I like to start this with plenty of time to spare so it has time to both cook and cool a bit before guests arrive. You can even make it the day before and serve it at room temperature. Garden spinach sounds like a great addition! I love a day before menu item! I never thought it would work with an egg dish. Thanks for the tip! Oh, yes! I also sometimes make frittatas in advance–or use leftovers the day after in a sandwich, yum. Though I am not an egg person, I can completely relate to daytime parties! Good friends and good coffee are better than a roomful of acquaintances and cocktails any day. Ok my inner 20-something self is freaking out right now wondering how her 43 yo future self turned out so boring! Oh well….I do know who LMFAO is…does that count? Oh absolutely!! One of the benefits of living a full active life in your 20’s and waiting until 30’s to have kids. We simply have a full, active life in a different way, but it’s soooo rewarding! Emmy, It was great to meet you! You are so sweet and I appreciate you introducing me to some of the other Seattle bloggers. Once I get back from vacation, we should definitely meet at the zoo. P.S. I am all about brunch get togethers and love a good egg casserole. It was so nice to meet you as well! Have a great trip and we’d love to get together–at the zoo or for brunch!–when you get back. Safe travels! Okay, so clearly great minds think alike! Our posts are so similar! Glad I’m in such great company. This one looks even easier than mine, but just as delish! Emmy, your posts never fail to make my mouth water! Looks absolutely yummy, Emmy! I like having brunch parties too. Somehow, it always seems much less stressful than full-blown dinner parties. I am all about the easy egg breakfasts for a crowd…stratas, breakfast brioche, baked eggs…you name it! We host brunch multiple times each month, and my menu is invariably a couple coffee cakes, fruit salad, a veggie crudités platter, and egg bake :). Always!! I love cheddar with green chilis, but I will give onions a try. Yum.